Valuable liquid latinum encased in relatively worthless gold dust. Standard of exchange throughout the Ferengi Alliance. Typically traded in bars, strips and slips; 1 bar = 20 strips = 2,000 slips. 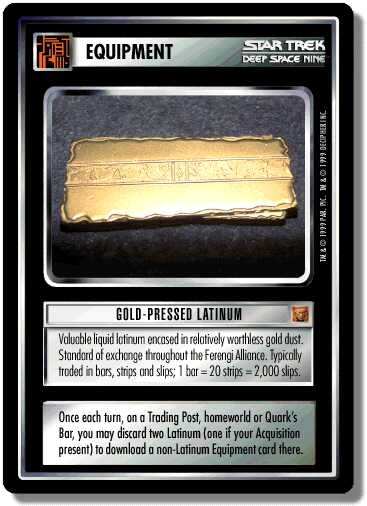 Once each turn, on a Trading Post, homeworld or Quark's Bar, you may discard two Latinum (one if your Acquisition present) to download a non-Latinum Equipment card there. There are 24 entries for Gold-Pressed Latinum (ST1E 8 C 17) at the Tradeplace (156 haves and 11 wants). Click here to see all trade list entries for this Common card!